A while back DanO and I painted our kitchen table with chalkboard paint. I had exactly zero desire to make it a DIY blog post, in fact I haven’t even mentioned it here at all, but I have put pictures out on twitter and instagram intermittently which brought a fair amount of curiosity. I promise I have no intention of going on a “here’s ANOTHER thing you can slap chalkboard paint on!” kick, but I do want to answer some questions about our experience. We have the Ikea Liatorp pedestal table in our breakfast nook. We purchased it from the as-is section of Ikea. Have you been there? Super awesome prices on returned and floor/display model furniture and items. An example of the kind of awesome scores you can find there, a few years ago we got our china hutch from the as-is section. It was the floor model and the doors didn’t open very well, so it was 50% off. We thought “Whatev, how often do you open a china hutch anyway? Totally worth $150 savings.” It was assembled, so we had to disassemble it to fit it in our pint-sized SUV (Ah, life pre-mini-van). As DanO was standing on the sidewalk outside Ikea doing his thing with an alan wrench, we realized that the door hardware was installed backwards, making the doors operate poorly. Now it works perfectly but it was still 40% off. BAM. Ikea as-is section. …the dents and scratches had little dent and scratch babies. We decided to do something about it, and that something turned out to be paint the top with chalkboard paint. First thing we did was pick out the type of paint we wanted. After reading several reviews (cough Pinterest cough) on brands, types, etc. 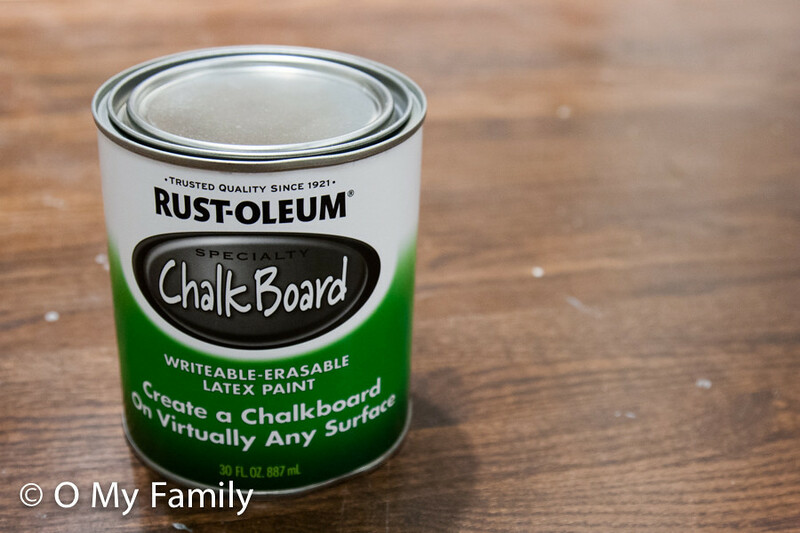 we decided to go with Rust-Oleum Specialty Latex ChalkBoard paint which I found at our local hardware store. But sanding by hand would definitely do the trick as well. For the first round of sanding, he used a lower grit paper for a more “rough sand” which he then followed up with a finer grit for a smoother sand. The objective here is to “score” the previously smooth surface so that the paint will adhere better. One thing we learned through this process is that some of the circular sanded patterns will show through the paint. This is ok, and I don’t think anyone but us would notice it since we know they’re there and are our own worst critics, but to minimize that, I would recommend sanding as evenly as possible. In some places, the composite wood beneath the white laminate coating showed through and kind of made me panic, but it turned out fine. 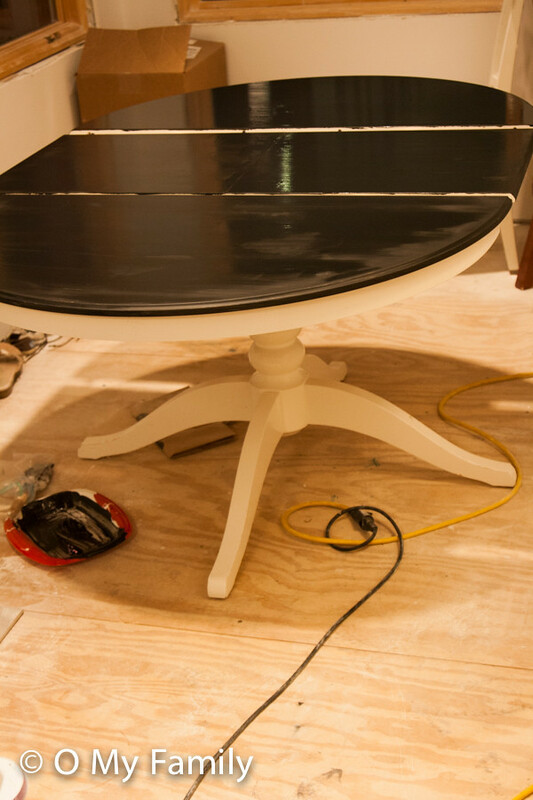 Because our table expands, we pulled out the insert and set it in place making sure to leave space so that we would get paint all the way to the edges of all parts. At first we thought we would use a foam roller to apply the paint, but it didn’t seem to leave a thick enough layer, so we switched to a brush. This means that if you look closely you can see brush marks, but I think this is only bothersome to my (bless his heart) perfectionist husband. The can suggested an 8 hour wait time between coats (of which we did two) and a four (painfully long) day wait before coloring on the surface. For that time, we didn’t tell the boys what the paint was, but OBoy noticed that we painted the table black. Imagine his surprise when we told him he could draw on the furniture! Once it can be drawn on, the instructions say to prime the surface by rubbing chalk on All Of The Things. It also says to do this anytime the surface is washed off. We did it that first time like good little instruction followers, but we have not done it a single time since. It’s a kitchen table. I am spraying and wiping it down at least 2 times a day and there’s no realistic way that I would scrub, wipe, and then take a few moments to slather with chalk. Nuh uh. Nogunna happen. I think the directions say to do this for future ease and erasability, but since I am using water or a surface cleaner every time I “erase” it, I have not noticed an issue in the least. 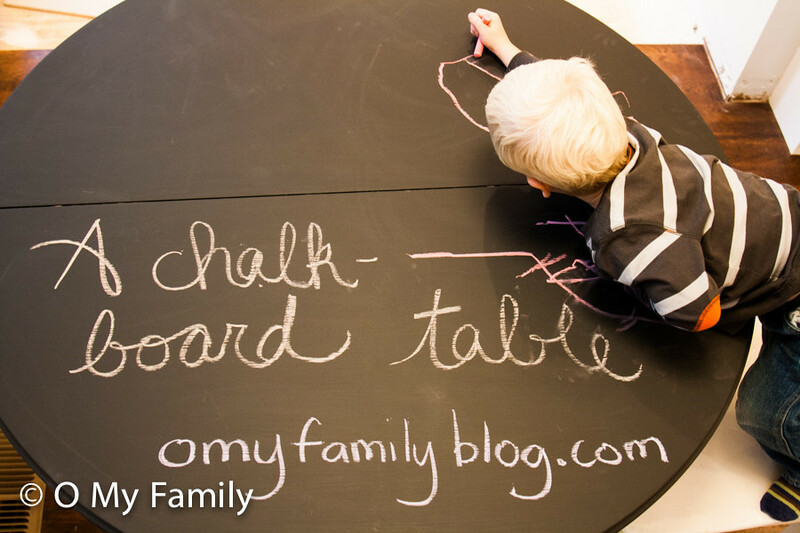 One of the main concerns I had about having a chalkboard table was the amount of chalk dust I would be managing. Being completely honest, it has not been a problem. Again, I use water or surface cleaner on a regular basis, so I think most of it comes off that way. Once or twice the boys have dragged themselves and their clothes over a chalk-covered surface and come away with chalk-covered sleeves, but one of the beautiful things about chalk is the ease of removal. It’s way tougher to get “washable” marker off of a toddler than chalk dust. Pat, pat, wipe, wipe, and we’re done. 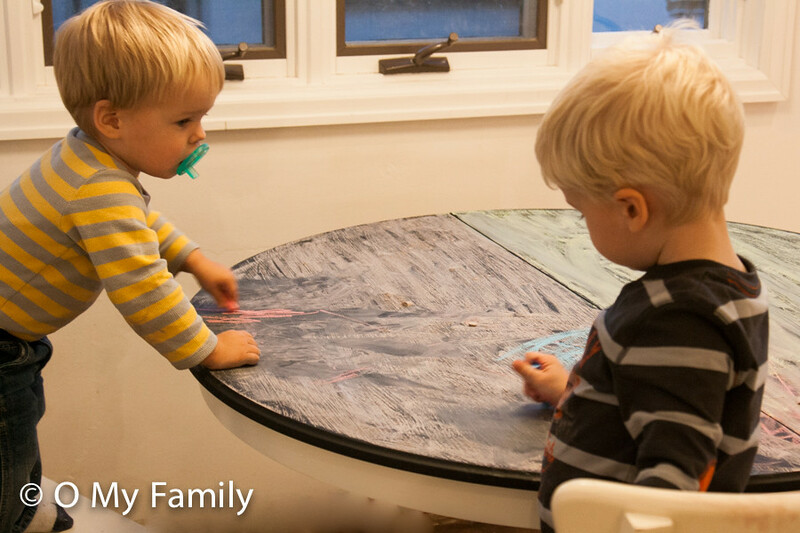 I have truly loved finding different ways to use the table as part of our family life. Birthdays, holidays, fun phrases and miscellaneous celebrations have been featured on the table. Several times I have written Bible verses as reminders of what we learned about in church that week or just what’s on my heart. DanO has been known to write me (and the boys) love notes via the table, and it made for a fun buffet set up at a party I threw in the fall, where tented food labels were replaced with chalk doodles. The one word to the wise I have is that it is not as durable as I would have hoped. To be fair, we have two children under four years old and we are not perhaps your average furniture users, but when the one and a half year old went all drummer with his fork after dinner one evening, it left marks. (cue: sad trombone) At this rate, I think we will probably do another coat over the top within a year. So, not great durability, but I would definitely do it again all considered. If you have any questions I haven’t answered here, feel free to ask! I’m an open book. I’ve loved seeing the different messages in photos on IG. Really fun option! It’s a beautiful table! Do you even get the “nails on the chalkboard” thing when the kids are sitting at or or when you move a bowl or cup back and forth? Yes, the nails on a chalkboard noise…that’s what I’m worried about! Maybe there wouldn’t be noise because it’s not actually a chalkboard? The slate is what would make the noise I think. You can also get chalk markers, which eliminate the noise and are brighter-colored than chalk…but maybe messier for kids. Just sayin. The chalk markers are brighter but very difficult to erase. They don’t completely come off. I have used them on my fridge that is covered in chalkboard paint and there is still a faint outline of the saying I had on my fridge after using soap and water. yes; how well does food (GERMS!) clean off of it, & how does it hold up to that? 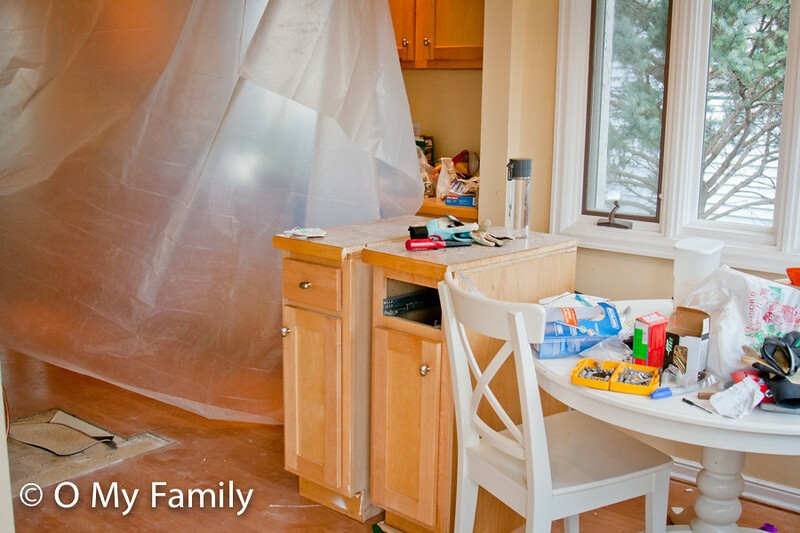 To be honest, it did not hold up as well as we had hoped as our kitchen table. It wasn’t stains, it was knicks and scrapes in the chalkboard surfacing. It is now our craft table in the basement which is a much better use for it, I think.